A modern classic one might call this dish as almost all the plant-based food bloggers and instagrammers have their version. And here is mine! It is an extra pleasure to share this with you as some of the produce used when cooking comes from my very own little container garden. This dish is a delicious way of cutting some (white) grains out of your lunch box or having a naturally gluten-free tasty version of pasta with pesto. 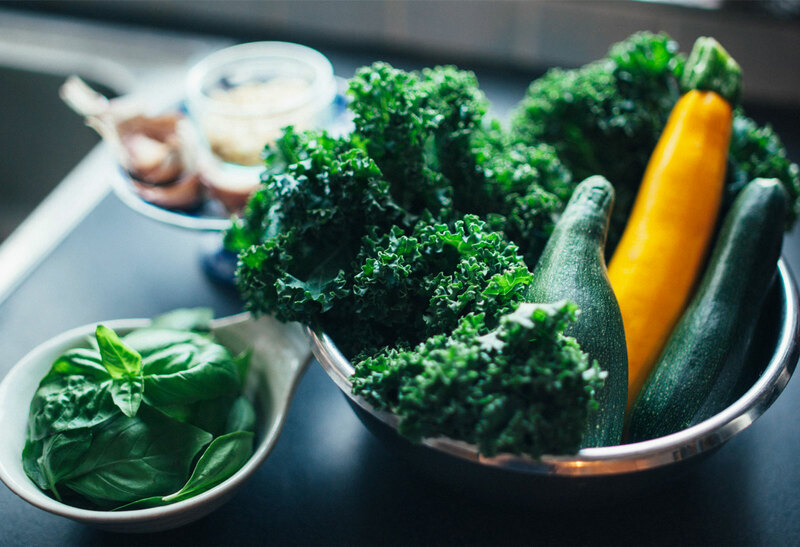 The kale gives the pesto a boost of nutritious goodness: fibre, antioxidants, iron and calcium, vitamin A, C and K and provide many more health benefits over all. 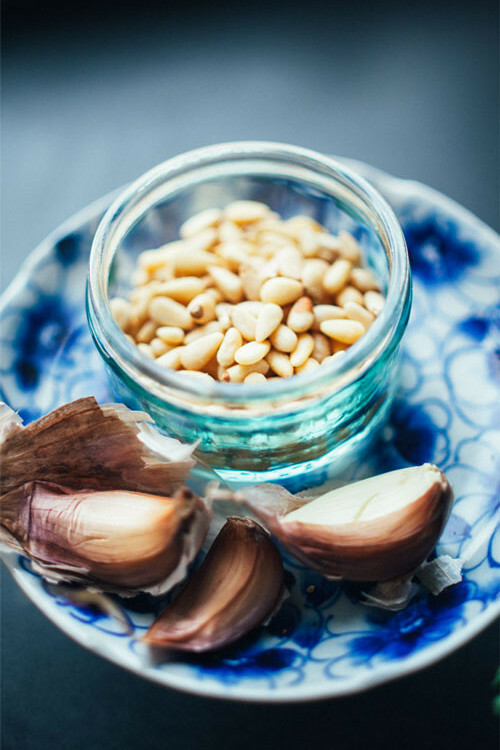 The garlic for example is a great anti-inflammatory and boosts your immune system. This recipe is easy-peasy and quick and basically raw. The only component which has been cooked are the sauteed courgette flowers which are really just a beautifully tasty bonus. All in all the dish has a little something for everyone! Process garlic cloves in the food processor until roughly chopped. Add kale, basil, oil and salt and process until the mixture has formed a paste. Julienne or spiralize courgette. If using a julienne peeler turn the courgette when you have reached the centre on one side as the center does not create strips but rather falls apart. 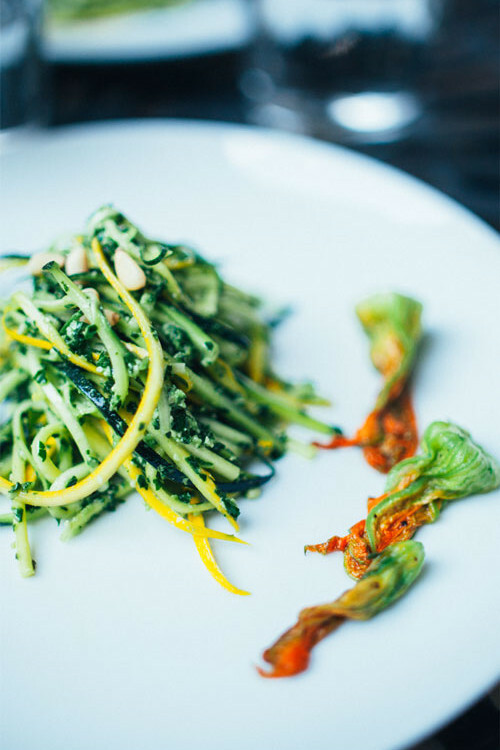 Place courgettie in a bowl and toss with the pesto. Place a pan over medium heat and add a splash of coconut oil, place flowers in pan and sautee for a few minutes until soft and slightly wilted. 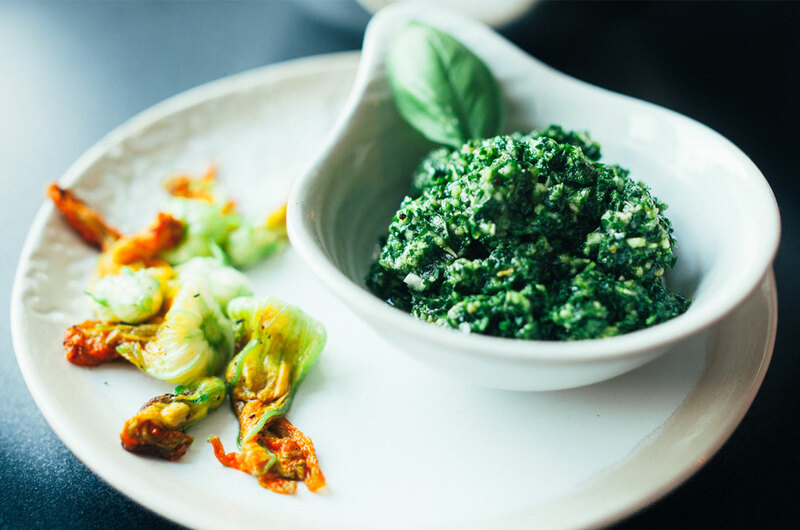 Add the flowers on top of the courgettie with pesto in the bowl and serve, or get creative on the plate.